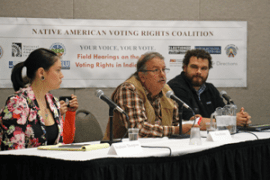 In September 2017, the Native American Voting Rights Coalition (NAVRC) began holding field hearings across the country. These hearings will document the unique needs and challenges faced by Native voters and identify successes to replicate. Please find below materials from those hearings. Gary Collins and Timothy Purdon listen as Professor Jerry Webster details physical barriers to voting in the Midwestern region. The Midwestern field hearing received testimony about Native American voting in North Dakota, South Dakota, Montana and Wyoming. Ten witnesses including community organizers, tribal members, elected officials, and a litigator, academic, and former US Attorney testified. Representatives from the region included members of the Confederated Salish and Kootenai Tribes, Turtle Mountain Band of Chippewa, Northern Arapaho Tribe, Crow Creek Sioux Tribe, Crow Tribe, and White Earth Nation. The Hearing was chaired by O.J. Semans, Sr. Executive Director of Four Directions. Jim Tucker, pro bono counsel for NARF, and Jacqueline De León, Voting Rights Fellow for NARF, assisted moderating the panels. Witnesses identified logistical barriers which make voting difficult in the Midwestern region. For example, distance to polls, poverty, and an inability to access transportation prevent Native Americans from voting. A history of deplorable voting conditions have fostered a sense of distrust of the voting process. Rude treatment during registration and at polls by poll workers serves to intimidate already insecure Native voters. Witnesses also reported a widespread distrust of state, county, and local officials. Testimony outlined a belief these officials are not acting in tribal members’ best interests and instead are conspiring to suppress Native vote. Additionally, witnesses testified how recently enacted voter laws in North Dakota have chilled Native American participation due to fear of being turned away at the polls. Voter suppression of the Native vote is persistent in the Midwestern region. Stephanie Thompson, Tony Brown, and Matt Dannenberg testify on October 16, 2017. 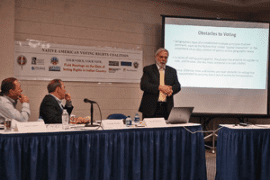 The Great Lakes field hearing was held in conjunction with the National Congress of American Indians Annual Convention and Marketplace in Milwaukee, Wisconsin. The hearing covered testimony about Native American voting in Indiana, Michigan, Minnesota, and Wisconsin. Eleven witnesses including community organizers, tribal leaders, tribal members, elected officials, and tribal advocates testified. Representatives from the region included members of the Bad River Band of Lake Superior Chippewa, Lac du Flambeau Band of Lake Superior Chippewa, Menominee Nation, Prairie Band Potawatomi, Ho-Chunk Nation, Mille Lacs Band of Ojibwe, Little Traverse Bay Bands of Odawa Indians, and Sault Ste. Marie Tribe of Chippewa Indians. The Hearing also included testimony from out of region witnesses including a Laguna Pueblo community organizer from New Mexico and a Tribal Chairman from Pyramid Lake Paiute Tribe of Nevada. The Hearing was chaired by O.J. Semans, Sr. Executive Director of Four Directions. Jim Tucker, Pro Bono Voting Rights Counsel for NARF, and Jacqueline De León, Voting Rights Fellow for NARF, assisted moderating the panels. Witnesses detailed widespread discrimination in the Great Lakes region. For example, Native American candidates who ran for office reported incidents of racist mockery and intimidation. Logistical barriers to voting included distance to polls, poverty, and transportation issues. Local officials employ intimidation tactics which discourage Native Americans from voting. Witnesses detailed how local sheriffs run background checks on Native Americans heading to vote and how one district placed its polling location in the local sheriff’s office. 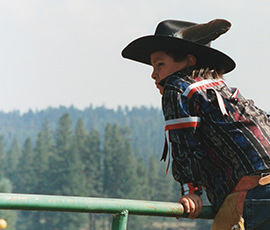 Witnesses described how non-competitive districts, inadequate representation, and historic trauma has fostered voter apathy among Native American voters. Voter suppression is persistent in the Great Lakes region. Testimony also included success for the Pyramid Lake Paiute Tribe in obtaining a polling location on its reservation following litigation against the State of Nevada.